Scientists trying to understand dark energy, one of the weirdest things in the universe, have made a step forward in determining how much of it could have existed shortly after the Big Bang. Dark energy is the mysterious force scientists think is responsible for pulling space apart at the seams, causing the expansion of the universe to accelerate. No one knows what dark energy is, and it hasn't been detected directly. In the new study, researchers used the South Pole Telescope in Antarctica to observe the cosmic microwave background, the pervasive light left over from the Big Bang that is believed to have kick-started the universe. This radiation holds a record of many properties of the early universe, allowing scientists to deduce the maximum amount of dark energy that could have been present at the time. 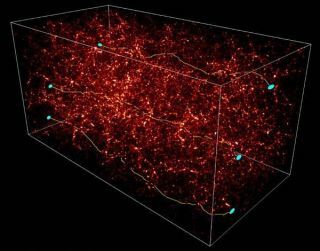 Based on their measurements, the researchers found that dark energy could not have accounted for more than 1.8 percent of the total density of the universe. By contrast, dark energy dominates space today, accounting for about 74 percent of all the matter and energy in the universe. One of the most popular theories of dark energy regards it as the cosmological constant, a term from Einstein's equations of general relativity. So, while dark energy now outnumbers matter by about three to one, that ratio would have been much smaller when the young universe was so dense with matter. Dark energy would have been extremely insignificant by comparison. What is dark energy, really? The new measurements are consistent with that idea, though they still can't serve to separate the cosmological constant theory from other models suggesting the early portion of dark energy, though small, was not negligible. Study lead author Christian L Reichardt, a cosmologist at the University of California, Berkeley, said models in which dark energy is non-constant "have some theoretical advantages." For example, he said, they can accommodate an odd coincidence: We happen to find ourselves in a universe where dark energy and matter are relatively comparable, without either completely dominating the other. These theories skirt around that issue by suggesting that the universe hasn't always been that way. Christof Wetterich of Heidelberg University in Germany, who in 1987 proposed a model of changing dark energy called "quintessence," said it is difficult to rule out such models, since they do not lead to a specific prediction for the amount of dark energy at a given time. "In any case, no deviation from a simple model with a cosmological constant is seen in the data [from the South Pole Telescope], and this is impressive by itself," Wetterich told SPACE.com in an email. "There can be at most a rather small fraction of early dark energy, consistent with the results of earlier investigations." Overall, many cosmologists favor the cosmological constant theory. "There's a theorem that the simplest explanation is best, and the cosmological constant right now is the simplest model that matches all the observations," Reichardt said. Image of X-Ray and optical data from Supernova 1E 0102.2-7219. The light coming from distant supernovas helps astrophysicists map out the universe and determine its rate of expansion. As scientists collect better and better data about the cosmic microwave background from experiments like ones using the South Pole Telescope or the European Planck satellite, the situation should become clearer. "This is an interesting paper," astrophysicist Bharat Ratra of Kansas State University wrote in an email. Ratra, who was not involved in the study, is the architect, along with Princeton University's Jim Peebles, of a time-varying model for dark energy. "Einstein's cosmological constant is very consistent with observational constraints from combinations of currently available data," Ratra said, "but dark energy that decreases slowly in time (and varies weakly in space), as in the model Peebles and I considered, is not yet strongly disfavored by the data. "The situation is likely to become much clearer in the next few years; these are interesting times for cosmology!" Reichardt and his colleagues have submitted their study to the Astrophysical Journal Letters, where it is currently undergoing peer review, and they posted it to the astronomy preprint site ArXiv.